There are three primary types of scars. Pitting scars (loss of tissue, craters, dent on skin) from acne or chicken pox. Here at Skin Perfect Brothers, we have four main scar treatment methods. For maximum results, different scar treatments can be combined to meet your unique skincare needs. Micropen – Microneedling (also known as Collagen Induction Therapy) is a minimally invasive treatment to rejuvenate the skin. A device with fine needles creates tiny punctures in the top layer of the skin which triggers the body to create new collagen and elastin. Results include improved texture and firmness, as well as a reduction in scars, pore size, and stretch marks. Fraxel laser – When using this deep resurfacing laser, results may be seen sooner. However, there may be downtime including a sunburned appearance followed by peeling to reveal fresh new skin. This process can take 3 to 7 days before full recovery. 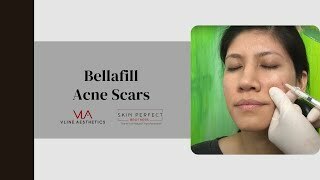 Bellafill -This FDA-approved, collagen-based filler can be used to reduce the appearance of smile lines and pitted acne scars. The injection immediately adds volume below the surface of the skin for smooth results that can last up to 5 years. Laser Genesis – This laser is a less-invasive alternative for those seeking minimal discomfort and little to no downtime after treatments. Because of it’s gentler nature, it will require 12 to 15 sessions scheduled 2-4 weeks apart and up to 6 months of skin-regeneration to see complete results.